For medium to long fences (up to 3 miles). A true low-impedance unit similar to the standard low-impedance units from New Zealand and US manufacturers. Recommended for sites where the grass remains green. Proven over years to be very reliable. Made by Horizont (who also make IntelliShock and Kube units for us). 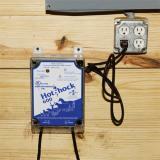 A 110v electric fence energizer used to keep in cattle, sheep, goats, horses, poultry and guard dogs. Effective at protecting against coyotes, stray dogs, bear and fox. It also works to keep out deer, raccoons and rabbits from garden/orchard areas. 8-17 rolls of 164' PoultryNet. Low-impedance units work effectively with high weed/grass loads, but not as well with dry soils or poor conductors. Safe to use with all polywires, polyropes, tapes and electrified nets. Modular so it can be easily repaired. 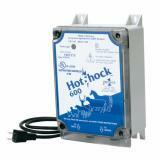 The HotShock 600 can be mounted either inside or outside of a building, but not where there is risk of fire. The energizer must be mounted vertically. Protect the energizer from direct rainfall. Connect insulated cable (stripped back 2-3" on ends) to the fence terminal on energizer, run the cable to the fence line and connect. It is working well to keep my goats in. I bought a 3 month old buck for my herd that wasn't used to electric. After the first day he hasn't touched the fence. A good fence charger to contain a small acreage. We probably should have bought the larger charger since we will have dry weather eventually; we shall see down the road. It works well and was easy to install. 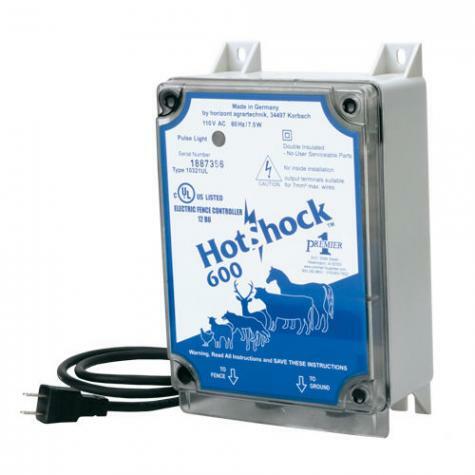 I was very impressed with the Hot Shock 600, the goats only got close to it once, the spark it left on the goats nose was enough to keep them contained from the start. A very easy product to install. Thank you for your fine products.